Turn Point Lodge, an idyllic hideaway designed by Tennent+Brown Architects, is perched on an isolated hillside overlooking part of the Marlborough Sounds. Each of the three component parts is clad and roofed with ColorCote AlumiGard pre-painted aluminium. The Ironsand colour was chosen to fit with the marine environment. 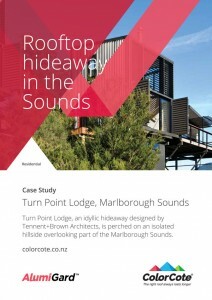 Because of its isolated location and limited access for heavy machinery – the most direct route to Turn Point Lodge is a 40-minute boat ride through the Marlborough Sounds – the three building units and subfloors were built off-site at Mahikapawa by David Kepes of Timbercraft Construction. The finished units were then lifted into position after a five minute flight down Pelorus Sound by a helicopter operated by Heli Harvest Limited. The helicopter had a five tonne load capacity but the marine environment and wind load considerations meant each of the units had to be kept to a weight of under 4.5 tonnes and had to be able to stay structurally rigid during the lift (the kitchen block was constructed and helicoptered in two halves). ColorCote AlumiGard pre-painted aluminium roofing and cladding is perfect for this corrosive sea spray environment. ColorCote AlumiGard is strong, lightweight, corrosion resistant, low maintenance and also helped provide the structural rigidity needed when the building units were airlifted into position.